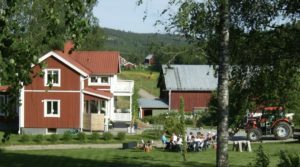 Welcome to us at Heleneborg’s farm in the scenic Tavelsjö countryside between Umeå and Vindeln in Västerbotten. 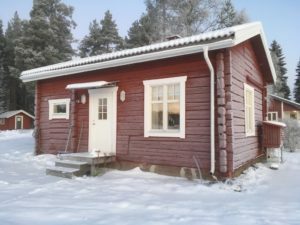 Here you can stay in a cozy, well-equipped log cabin or a timbered bakery cottage or in one of our three rooms upstairs in the barn. 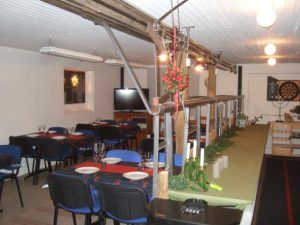 Here you can place gatherings in our unique meeting room in the converted stable with attached kitchen, terrace and outdoor spa with sauna and hot tub. We provide stress-free environment for both relaxation and creative meetings. Well-equipped kitchenette with stove, fridge, freezer compartment, dishwasher, micro and coffee maker. Living room with sofa bed, TV, stereo, DVD and wood burning stove. Two bedrooms. 5 beds. Toilet with shower, porch and sun deck. 100 Mbit Wi-Fi. 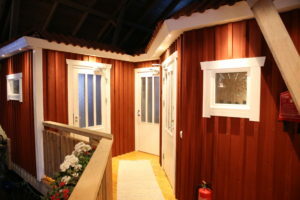 Loft cabin can be rented extra summer time. 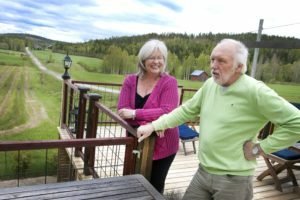 Unique accommodation in a renovated 19th-century backyard with a very high standard in a scenic location. Cottage with roof up in the nock with baking oven and wood burning stove. 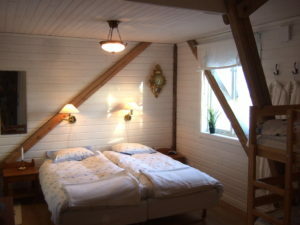 Cozy sleeping loft with two 80 cm wide beds. Seating area with sofa bed (width 140 cm) and two armchairs, food group, 40 inch TV, retro-style multi-audio system. However, the baking stove can not be used by guests. 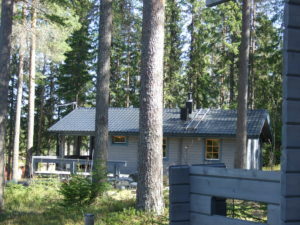 Very well equipped kitchen including stove, fridge and freezer, dishwasher and microwave. Bathroom with sink, water toilet and shower. Floor heating. Choose between The Small Room, “The Between Room” and the Big Room. 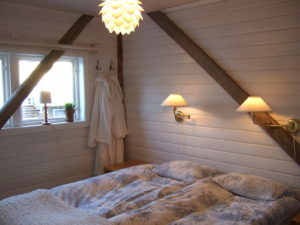 The Big Room is a family room with both a double bed and a bunk bed. In the larger rooms there is a sink, kettle and fridge. 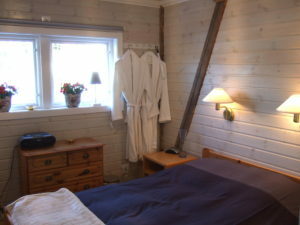 All rooms have comfortable beds and access to 100 Mbit Wi-Fi. Toilet and shower in the stables milk room down stairs. The exterior of the rooms is a bright red with white knots and window lining. In the rooms we have kept beams and stag giving them a special character. The rooms can be rented with or without breakfast. 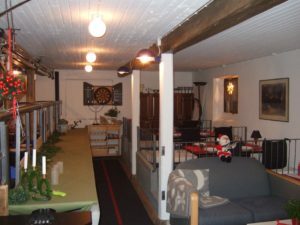 Our converted stable offers a unique environment for meetings and gatherings of up to 20 people. It combines old interior features with modern conference technology – broadband (100 Mbit), image projector and Smart-TV. Suitable for everything from board meetings and seminars to kick-off and team building. 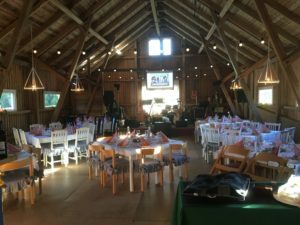 The stable is perfect for parties of all kinds from birthday party to spa evening with friends. 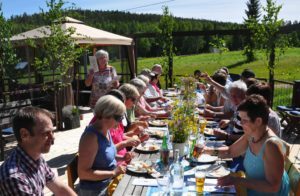 Enjoy a nice meal on the terrace, at the long table in the meeting room or in the calf box and socialize in our combined children’s and minicorns. 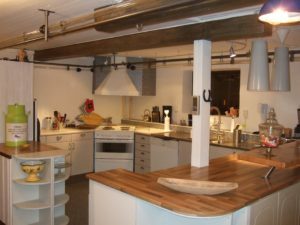 The stable contains a well-equipped kitchen where we can cook for smaller parties. The food is served on the stall’s covered feeding table. The meeting room can be dressed for conferences and parties. 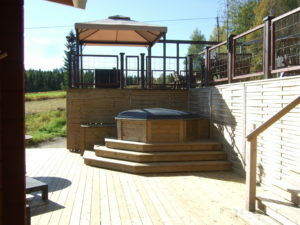 Hot tub and sauna in our spa area. 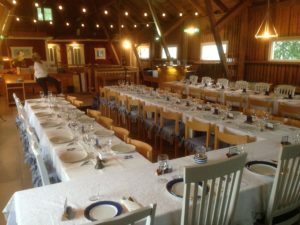 The party room prepared för wedding party. Stage with sound system and image projektor.